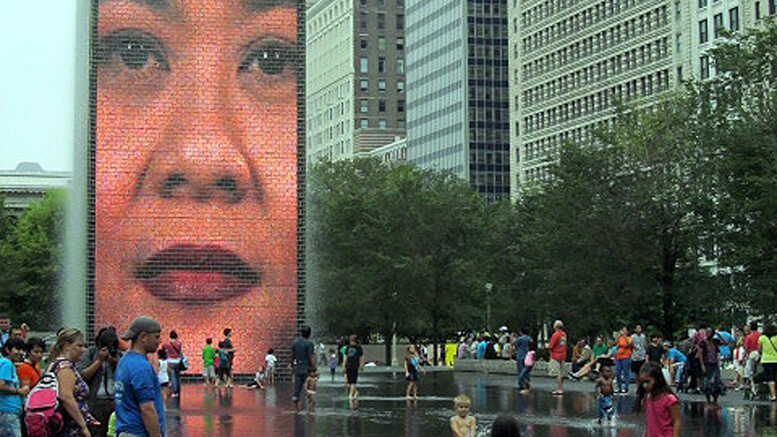 FACING OURSELVES: The diversity of the crowd in Chicago's Millennium Park reflects humanity not arrogance. Picture: AsPerceived. IRKED by arrogance, AsPerceived Quarterly contributor Frank Bradford, looks for some humility. I AM white, middle-aged and grey-haired. I like to think I’m reasonably well-educated and have some ‘nous’. I learned some history at school, nearly 50 years ago. I was taught how parts of the islands of Britain and Ireland had been repeatedly overrun over the last 2,000 years – by more ethnic groups than I can now remember. I can recall these included the Romans, Picts, Celts, Angles, Saxons, Norsemen (and probably women), Danes and, Normans but forget others. I was informed that what came to be the United Kingdom (as a maritime nation) ‘went exploring’ over the centuries, establishing settlements in many parts of the world. I remember learning about the ‘rush for empire’ in the 19th century that became so fashionable that almost every dynasty in Europe was involved … and just how much of the world maps was coloured pink to represent Britain’s ‘possessions’. At that time, skills taught in (primarily England’s) elite schools and universities created an administrative echelon that helped establish the legislative, judicial and executive structure that introduced more formal government and governance to the ‘colonies’. I became aware that the legacy everywhere, once the UK was at the vanguard of the post-colonial era, was not always glorious or a source of great pride. I realised that despite the European cultural legacy of more than 2,000 year’s, the ‘white man’ – and in those days it was always mankind – was no better than anyone else from any other ethnicity who had a chance to learn. The nationalistic focus of history taught in the 1960s and 70s in England conveniently overlooked the scientific marvels of the early centuries of Islam in the Middle East, the cultural wealth of China and Japan or the heritage of Native Americans, for example. I remember too, as a child, being raised in a very white area of England. By the time I was six or seven, I hadn’t seen many people of other races. Later in life, I may have become increasingly distant from my step-mother, but to this day I acknowledge her intervention when I made a comment, while we were out, about seeing someone black all those years ago. The sentiment has stayed with me ever since. She also told me that a great grandfather, after whom I was named, was a migrant from eastern Europe who arrived in the north of England in the 1870s. He established a relationship, a family and a business here. I suspect that was hard but he succeeded. Those around him in northern England supported that business, providing him with enough customers and enough work for it to flourish and contribute to the economy of the time. The UK, like the US, took in large numbers of migrants at that time. It’s hard to imagine that some would not have resented their arrival but, despite the upheaval, they ended up getting along together. Whatever disruption there might have been then never featured on the school history curriculum of the 1960s. The history of invasions past means that, although predominantly Caucasian, the ‘whites’ living in England, Scotland and Wales, still come from centuries of ‘mixed blood’. Population movements may cause resentments but, over the centuries, common humanity has prevailed and homogeneity has appeared. However limited my schooling may have been, I have – over the 40-plus years since I walked out of a classroom for the last time – become increasingly convinced that if there’s any one single truth in life, it’s that as a white man, I’m no better, or worse, than anyone else. I have also realised that I cannot – and probably will not – ever fully understand a white person who thinks differently. That said, having studied psychology for a while, I do believe that (faux) bravado is a frequent manifestation of inner inadequacy. If that’s the case, perhaps my perceptions of ‘supremacy’ as an angry, immediate, emotive reaction to a realisation of powerlessness (especially among those who have developed an unrealistic concept of their own value – be that economic, intellectual or political) are reasonably well-placed after all. 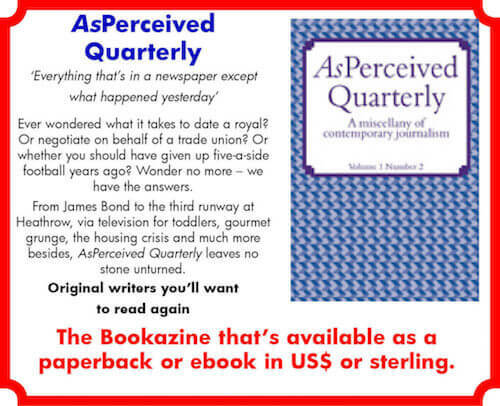 Read Frank Bradford’s analysis of political ‘disconnection’ – Called to Account – in AsPerceived Quarterly, the innovative ‘bookazine’ available from amazon.com in US dollars or amazon.co.uk in sterling, as either a paperback or e-book.